1. Achillea. Achillea, more commonly known as Yarrow, is the perfect plant for a sunny spot. The flowers are landing pads for butterflies and the leaves are feathery and and almost as attractive as the flower. 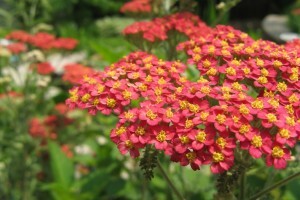 Achillea blooms all summer long, comes in a variety of colors and is a wonderful cutting garden flower. 2. Hollyhock. 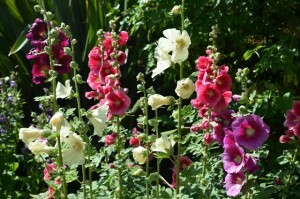 A mainstay in nearly every cottage garden, Hollyhock is an heirloom plant which thrives in sun. The height of the plant makes it a natural to be placed at the back of your garden bed (or along a fence) and the flowers quickly become the focal point of a garden. Single or double cultivars come back year after year. 3. Japanese Anemone. Looking for a super-reliable perennial which does well in shade? 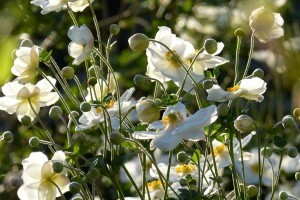 Then, you’ll love Japanese Anemone! This flower comes back year after year, thrives in shade (though it can also tolerate sun) and brings a welcome burst of color to the late summer to late fall garden. Tall stems hold beautiful flowers in shades of white, magenta and pink. 4. 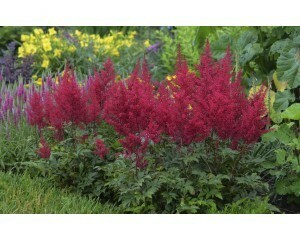 Astilbe. Another proven winner, this perennial is perfect in a shade garden and it is extremely hardy. Beautiful foliage is accented by colorful “feather” blooms in the late spring. Provide plenty of moisture to keep the leaves from curling or browning and you’ll have a perennial that looks great from Spring through Fall. 5. Coreposis. Coreposis is an extremely long-blooming, sun-loving perennial. 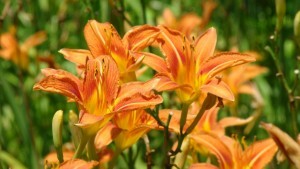 It flowers from June to October so, while it is a perennial, it flowers like an annual. 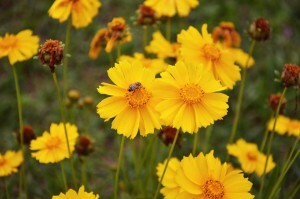 One popular variety of Coreopis is “Moonbeam,” a deep, vibrant yellow variety, which adds a great splash of color to any garden. 6. Shasta Daisy. 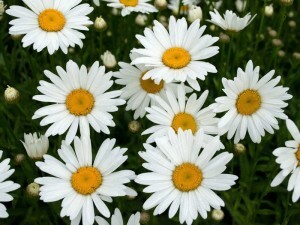 Nothing is easier to grow than a Shasta Daisy! Plant in full sun, make sure the drainage is good and presto! You have a field of daisies right before your eyes. Shasta Daisies have a long flowering period and are a beautiful complement to Irises in the late spring and Yarrow all summer long. 7. Cardinal Flower. 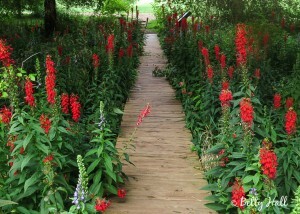 The Cardinal Flower is a hummingbird magnet so, if you’re a bird lover, this is the flower for you. Cardinal Flowers are very striking and appear in late summer. Plant in a moist, shady spot and add lots of organic matter to make sure your Cardinal Flower thrives. They look especially lovely paired with ferns or astilbe. 8. Russian Sage. 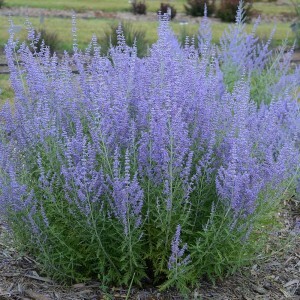 Many, many gardeners simply love Russian Sage and for a very good reason. It’s striking, lasts for a long, long time and provides weeks and weeks of flowers. This sun-loving perennial has fine, airy foliage and gives off a lovely fragrance. Its bluish-purple blooms add a cool color component to the garden. The good news/bad news about Russian Sage is that it is very hardy and can spread. If you don’t want it to take over your garden, cut it back at the end of every season. 9. Phlox. Phlox in mid-summer is a beautiful site in the perennial garden. Some gardeners say that shape of the tall flower is reminiscent of a large exclamation point! Phlox are elegant and while they do prefer sun, they thrive in almost any soil condition and come back year after year. The classic variety “Mt. 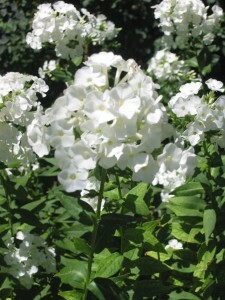 Fuji” is a particularly stunning white phlox and works well with delphinium, daylilies or hollyhock. 10. Daylily. Daylilies are often referred to as the “perfect perennial” because this plant is so easy to grow and comes in dozens and dozens of colors. Daylilies bloom from late spring to early fall producing anywhere from 200-400 flowers a month which is why they are such a popular choice for public gardens. Maintenance is low but, like Russian Sage, they do tend to spread, which is great if you want lots of daylilies in your perennial garden. Even if you like annuals, you definitely need to have at least a few of these easy-to-grow, low maintenance, pretty perennials as part of your garden scheme. Perennials are the backbone of every successful garden!